What’s it like for a group of students to design and build a sustainable landscape on campus within a single semester? In this tour, NC State landscape architecture students take you behind the scenes at a project in development outside Syme Residence Hall. 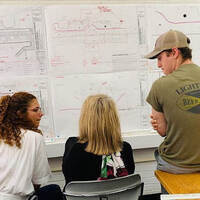 As you get a sneak peek of the new landscape, students will showcase the design process, sustainability features and the unique design-build course that makes the project possible. Free and open to NC State students, faculty, staff and members of the community.